What size of center are you wishing for? MM? Basically, please be more precise. The square emerald looks to be around 10cts & colourless, so the answer is NO - by a long shot. Five carats should be possible. Do you find that one attractive in the rotating photo? First off, are you ok with a cream tinted diamond? 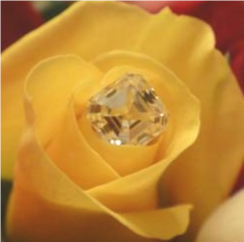 A large diamond is going to show flaws and color more than a smaller one. If I were you, I’d call David at Diamonds by Lauren and/or Email yoram at Gem Concepts and see what they have/can find for you. Matthews1127, Octo2005, lovedogs and 2 others like this. Oh, also maybe call Yekutiel at ID Jewelry. He helped someone here find a beautiful 3+ carat asscher. Just don’t with that one. Matthews1127, lovedogs, SandyK and 1 other person like this. It’s ok, that is why we are here. Matthews1127, OoohShiny and Rfisher like this. scarsmum, Matthews1127, diamondseeker2006 and 3 others like this. US$41k is 'a bit' over $100k? What is your absolute top budget? NK2012, Octo2005, LinSF and 2 others like this. There are never many options for such things in the wild. ceg, OoohShiny and whitewave like this. Oh, also check Leon Mege, but he is likely out of budget. Victor Canera as well. Performs nicely head-on but leaky/'window-y' at most tilt angles - it's a No from me. Hounddog, Matthews1127 and Rpb like this. Leon has this one, which was sold, but it seems to be the setting you want. This looks correct 4EVS1 & I would wish an interesting object - www or These grown up! Prices are chaotic. I am wishing for the 5 cts marc in colourless. 5 ct will be too small. Contact Sam at Ice Rock, he sources amazing, huge diamonds! Emeraldcutlover and Matthews1127 like this.